EpilatorGirl > Tips > Epilator vs. Waxing What’s Your Favorite? Epilator vs. Waxing What’s Your Favorite? Waxing is effective, there’s no one denying that. It remains the favorite hair removal method for many women and was the favorite for my friends, too. Almost all my girlfriends were getting waxed at a beauty salon, while I was still shaving. But I decided to give a chance to waxing since they were so satisfied with the results. The first time was painful, at the end I was surprised that I stood there and took all that pain in without saying anything. I couldn’t really complain because I was ashamed of making a fool of myself in the presence of the professional woman handling the wax. I was expecting to feel pain but not that much. I was kind of satisfied with the result. The downside was that I was left with tiny hairs, maybe the fault was with the professional doing the waxing but that’s what happened to me and my legs. What I didn’t like was the pricing. If I were to get waxed once every 3 weeks on average, I’d better had the money to afford it. I decided that it was not worth it. I went back to shaving until one day a friend showed me her epilator. I was getting an epilator. A major pro for epilators is that I don’t have to wait for the hairs to have the proper length. I can plug it in whenever I want to because nowadays most epilators are really good at removing tiny hairs by the root. The hairs have to be a little bigger so that the wax can grab them. That meant that I had to wait for about 3 weeks in order to have an efficient waxing session. That’s not pleasant in the summer because the hairs were pretty visible. It’s nice to have someone doing things for you. It’s nice to just relax and have a professional handle the problem of unwanted hair. I enjoyed that part of the waxing process. 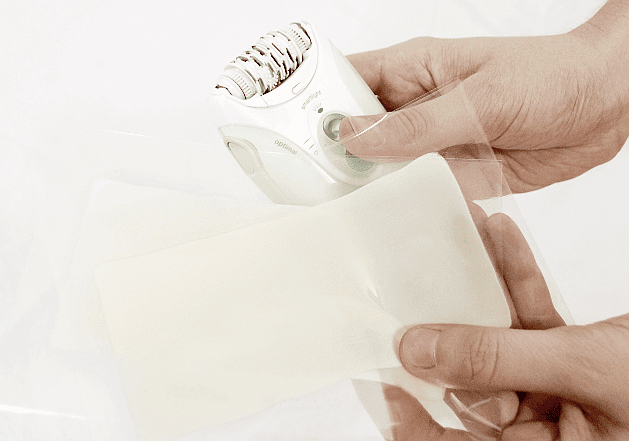 When I use my epilator I have to do all the work, I have to hold it and move it slowly until there are no more hairs left and then move to another part of the skin and so on until my body is happily hairless. Using an epilator is much more time consuming than waxing. Professionals in beauty salons move really fast. You have to be extremely patient but there are women who just don’t have the patience required so they decide that epilation is definitely not their hair removal method. I utterly understand their point of view. The hair grows thinner in time, at least that’s how I feel. I know that hairs grow in cycles so if I were to leave it grow for many months in a row, it would be just as dense and as thick but the point is that I don’t leave my body hair to grow for months in a row. That’s why for me it seems that thinner and fewer hairs are present on my skin. Don’t expect it to be gone for good, only electrolysis is capable of that but that’s out of my budget by a long mile. As your hairs go through many sessions of either epilation or waxing, the duration of having the hair removed through either of the two methods diminishes considerably. In my case I also got accustomed to the pain in time. Time and pain are the most important arguments brought against using an epilator or a waxing kit. I remember when I used an epilator for the first time. The pain made me literally sweat, especially when removing hairs from the bikini area and my underarms. When removing hairs from the legs the pain was quite supportable, especially up to the knees. Above the knees you feel pinches that hurt quite a lot. That first experience wouldn’t have been so awful if I hadn’t given up waxing for shaving and only then went on to using an epilator. If I had used an epilator immediately after deciding that waxing wasn’t for me, then the pain would have been entirely supportable. In my waxing days I also tried doing it at home with body strips and facial strips for my upper lip. The body strips were not that great or maybe I simply didn’t know how to use them or got some that weren’t so good. But they weren’t getting most of the hairs out from the first time or the second time. The wax strips for face were wonderful. Until using facial wax strips for my upper lip, I was using a tweezer and that took plenty of my time and a lot of stress on my neck muscles because I was looking in the mirror for so many minutes. I gave up waxing when it came to my legs, underarms, and the bikini area but continued using wax strips for my facial hair removal. It only takes 2 minutes, the pain is mild, and a pack lasts for about 2-3 months. I’m using an epilator that comes with a facial cap to remove my facial hair. I own two of those, actually. I oscillate between my Silk Epil 7 and my Braun Silk Epil 9561. The pain is a bit intense in the beginning, the facial skin is really sensitive but the results are totally worth it. It’s over in 2-3 minutes. As soon as I become really comfortable with something, I’m going to stick to that thing, it’s very hard for me to let things go. I believe that as long as you’re satisfied with your chosen hair removal method, there’s no point in changing it, whether it’s waxing, shaving or epilation. For me, it’s epilation. It has been so for about 9 years now. As long as I keep ingrown hairs at bay, I’m a totally happy person with my chosen hair removal method.